In my sermons on Sunday morning [5 August 2018] in Saint Mary’s Church, Askeaton, and Saint Brendan’s Church, Tarbert, I am hoping to reflect on Christ’s discourse after the feeding of the multitude (John 6: 24-35) and how we can be the hands of Christ as we reach out to those in need and those on the margins. Some of my thinking and praying on this Gospel reading this week was been helped two days ago [1 August 2018] by seeing ‘Healing Hands,’ a sculpture by Shane Gilmore that was installed in ten years ago [May 2008] in grounds of the Cathedral of Saint Peter and Saint Paul in Ennis, Co Clare. Shane Gilmore is an artist and sculptor living and working in Co Clare. His works include public art, figurative sculpture, surf art, and mixed media work. His sculpture of two clasped hands in Ennis is based on the hands of the former Bishop of Killaloe, Bishop Willie Walsh, and was designed to be used as seating. Six plaques on the base of the sculpture have different references to hands as hands of Welcome, Peace, Healing, Co-Operation, Faith and similar themes. Hands of Healing: remembering walk of reconciliation by Bishop Willie Walsh for Jubilee 2000. Hands of Welcome: acknowledging the presence of emigrants, asylum seekers, refugees and fellow EU citizens in our community. 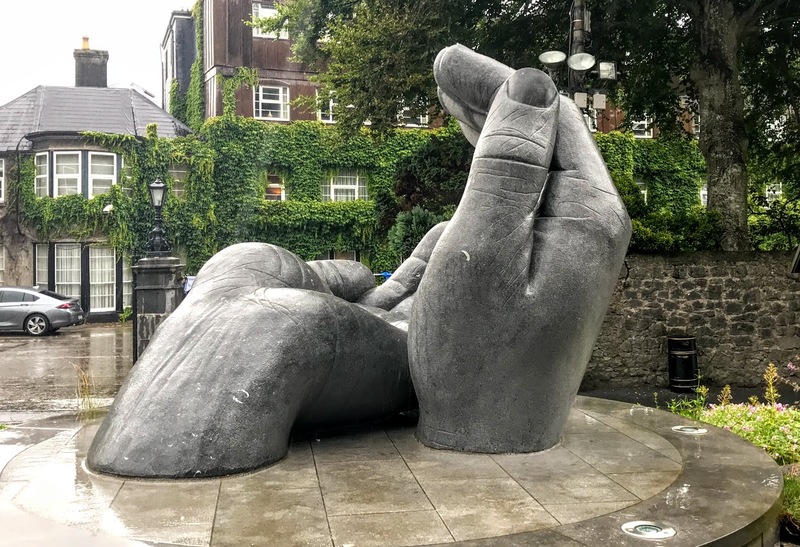 Hands of Peace: marking a new era of peace on the Island of Ireland. Hands of Co-operation: celebrating Ennis Ireland’s tidiest town in 2006. Hands of Faith: recognising the faithfulness of parents and grandparents for handing on the Christian faith to the next generation. ‘I will not forget you, I have carved your name on the palm of my hand’ (Isaiah 49: 15). Shane Gilmore works mainly in stone and wood. His public sculptures throughout Co Clare can be seen in Liscannor, where his bronze sculpture of the submarine inventor is placed, and Ennistymon, where his limestone carving of the poet Brian Merriman is seen. 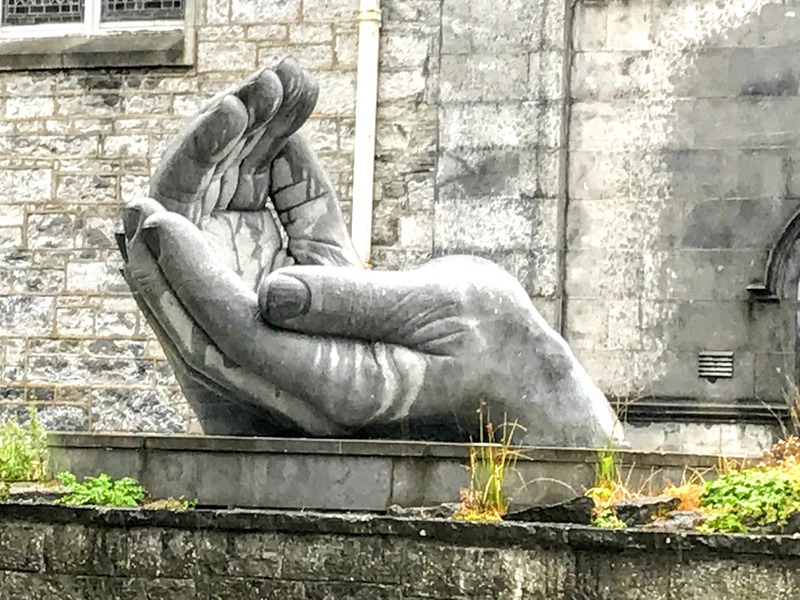 He has also produced numerous pieces in Ennis and ‘The Miller Returns,’ a sculpture that stands in the O’Garney River below the bridge in Sixmilebridge. The sculptor claims this ‘is probably the manliest sculpture in Ireland.’ This is a shirtless, limestone man marching unimpeded through the waters of the river, carrying the heavy tools of millwork, recalling the 17th century settlers of Dutch origin who started the mill on the river. Shane Gilmore points out that the strongman proved his brawn in 2009 when the statue held its ground as flood waters threatened to take the artwork downstream.